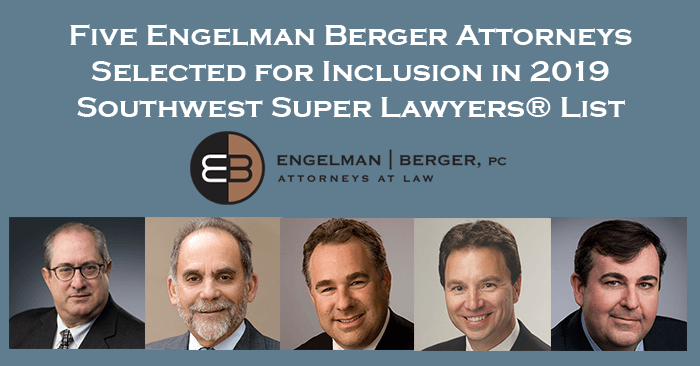 Five Engelman Berger attorneys have been selected for inclusion in the 2019 Southwest Super Lawyers® list. These attorneys have displayed excellence in the categories of Bankruptcy, Alternative Dispute Resolution, Business/Corporate, Business Litigation, Real Estate, Creditor Debtor Rights, Closely Held Business, General Litigation, Banking, and Civil Litigation: Defense. Congratulations Steve, David, Scott, Kevin, and Patrick! Steve Berger was also selected again by Southwest Super Lawyers® as one of the Top 50 Arizona Lawyers. Congratulations, Steve! We would also like to congratulate Patrick Clisham for being included for the first time in the Southwest Super Lawyers® list! Super Lawyers® is a legal industry rating service of outstanding lawyers in more than 70 practice areas who have attained a high-degree of peer recognition and professional achievement. Only 4% of attorneys in Arizona are named as Super Lawyers® and only 2.5% of lawyers under the age of 40 are named as Rising Stars. For more information about Super Lawyers®.